Ghouls, biters, the living dead... call them what you will, zombies make awesome movie nasties and zombie videos make an awesome theme for a video night. So slap on your zombie make up, perfect your undead groans and settle in for the night with some of these movies. And in the most recent addition, Survival of the Dead, National Guard deserters come in between a feud between two Irish families. 28 Days Later and 28 Weeks Later are English horror flicks that chart the outbreak of a virus that turns normal people into aggressive cannibals. The first movie follows four survivors as they search for civilization while the sequel sees another outbreak just as Britain is rebuilding. 28 Days Later was written by Alex Garland, author of The Beach. I Am Legend is a post apocolyptic science fiction movie that sees Lieutenant Colonel Robert Neville as the last human living in New York City after a man-made cancer vaccine turns the city's residents into zombies. Neville spends his days hunting these creatures, trying to create a cure and mourning the death of his wife and son, but also trying to live a normal life. Plan 9 From Outer Space is a notorious 'so good it's bad' flick and has had the dubious honour of being dubbed the worst film ever made by many respected critics. The plot sees an alien invasion create an infestation of undead ghouls. The continuity eras – watch as shots interchange between day and night – and dodgy special effects are the best things about this movie. 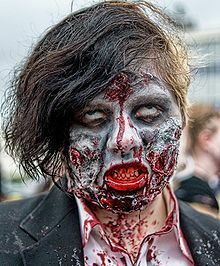 Dead Set is a British television series that poses the question – if zombies took over the world, how what what happen to the cast of Big Brother? The horror drama sees the Big Brother house become a shelter from the threat, and it's will inhabitants do anything they can to survive. If all this death and brain eating has you down, end the night with a laugh. Zombieland is a black comedy that follows four survivors as they drive to find a sanctuary from the zombies. Stars Woody Harrelson and Jesse Eisenberg from The Social Network and features a hilarious cameo from Bill Murray. Also worth checking out – Shaun of the Dead (comedy starring Simon Pegg and Dylan Moran) and Planet Terror (action movie starring Rose McGowan and Naveen Andrews). If you can find any of these at your local video store, you should be able to find them at Netflix.